OUR 2019 kids arE all spoken for, but if you would like to be on our waiting list For 2020, send us an email. Why our goats are special: We hear from everyone who buys our goats that of all the places they visit, our kids are the most friendly. They are like puppies who love to be held and played with. Many visitors come by to hold the kids as they are born and in the 8 weeks before they are picked up, so they love people. We are taking names and email addresses now for 2020 kids. Putting in your name will get you on the list. In October we will contact people on the list and collect deposits. We ask people to put down a deposit of $50. 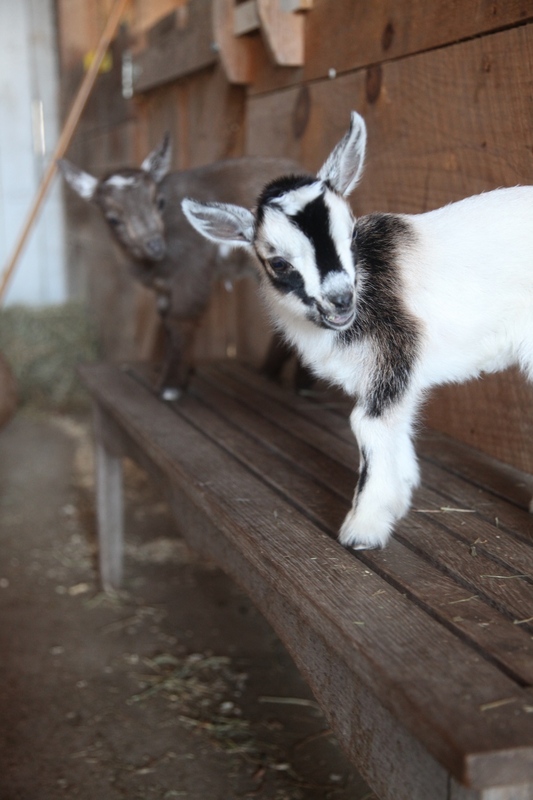 to reserve a goat early, which will give you first right of refusal on the goats born this spring. (This deposit is nonrefundable, except in the case of unforeseen major life events, as it covers the expenses leading up to kidding and the time we put into communicating and meeting with new owners.) In 2018, we completed the deposit list in October 2017, so consider early and act quickly. We love that we develop a relationship with owners and are sure all our goats are going to loving well prepared homes each year. We are so excited to have handsome Dulcimer at the farm this year. He is such a gentle boy. We bought him from Blue Tin Farm with our friends at Toots in N. Yarmouth. He will be helped out this year by adorable buckling Galactic Jack (see above photo) who is sure to make some flashy babies. Once the kids are born, they need 8 weeks with their mom to drink milk and get strong, so in mid June/early July they are ready for new homes. At pick up, people pay the balance which depends on the kid’s mother. Neutered males are $150. The doelings and ducklings are $350. Goats must be sold in pairs unless they are purchased as a companion for another goat that is already owned by the purchaser. We now have some serious dairy stock. As you go through our doe’s pedigrees, you will see some of the finest bloodlines in the country, including: Old Mountain Farm, Twin Creeks, Rosasharn, Prairie Wood, Stonewall, Denning Hill, Spring’s Run, Dawnland, Valley View, Morning Star, Flat Rocks and Fairlea. All of our goats are registered with the American Goat Society (AGS). If you choose to, yours can be too! We will give each new owner registration papers. Our whole herd tested negative for CAE and Brucellosis in 2011. Since then any new additions have been from tested herds. Meghan and Kelsey at Annabessacook Veterinary Service helps us keep all our does and kids in the best possible health. As we have had more and more kids each year, we have focused on energy on communicating with new goat parents and posting to Facebook, and have not posted their pictures on the website, but below are some pics of the kids from earlier years! Some past KIDS IN PHOTO GALLERY BELOW!